We are often asked by teachers if we can think of medieval activities for the students to undertake whilst other groups are in our workshop. This is usually for activity days/weeks. To this end we have created two new activities to be led by teachers for students studying KS3 medieval life. We believe that these activities will suit students from Year 5 to 8, depending on their abilities but is primarily aimed at years 6 & 7 who usually study this topic. These activities can be brought in to your school to borrow for the day at no extra charge, should you hire us to run a KS3 medieval workshop of any sort but you must let us know well in advance of the day that you would like them as we do not carry them with us as a matter of course. This game was created as children often asked me “Is it real?” about the replica items in our workshop. So we thought it would be great to give them something that really was real. Most of the artefacts in this game are therefore real historical items and are over 500 years old. A skeleton has been dug up by archaeologists at an abandoned medieval villlage. Certain artefacts have been discovered with it. 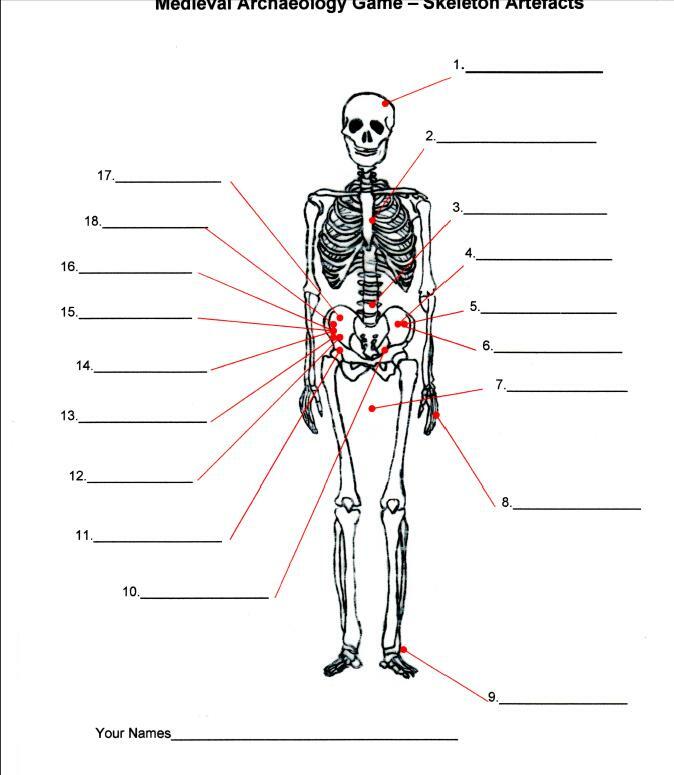 It is up to the students to work in pairs/groups and work out what the artefacts are and what they were used for and label the skeleton on their worksheet. 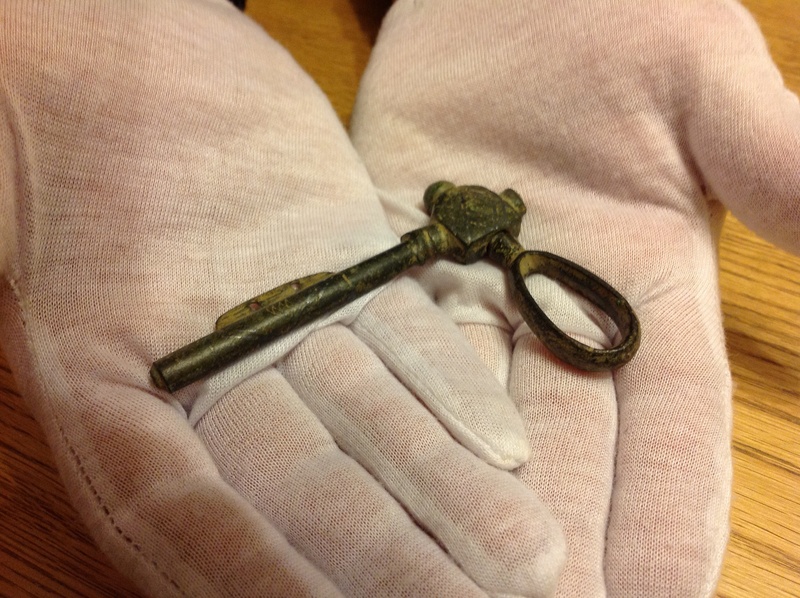 Most of the the items are original medieval artefacts such as a key or a ring and are over 500 years old. Many of the items have a connection to a particular trade. The students are given a list of all the major people who lived in the village at the time the skeleton dates to and their trades. Students have to work out who the skeleton might have been. This activity will last anything from half and hour to an hour, depending on how the teacher wishes to pace it. An electronic version of the worksheets for the activity can be sent in advance of the day to allow time for teachers to photocopy them. This activity is designed to raise an understanding of how long ago the medieval period was, how different and similar it is to today and hopefully to raise an awareness and interest in archaeology. Thomas Becket has been studied by every school child since the year dot so we thought it would be great to base a fun activity around him. A huge industry connected to the saint arose after his death in the form of pilgrim badges. Orginally pilgrims would try to take parts of the saints shrines themselves so the idea was conceived of pilgrim badges, which would have a special religious significance because they had touched the tomb of the saint and were therefore holy relics in their own right. Pewter was easily moulded (like plastic) and cheap to make. There were many badges connected to St Thomas. 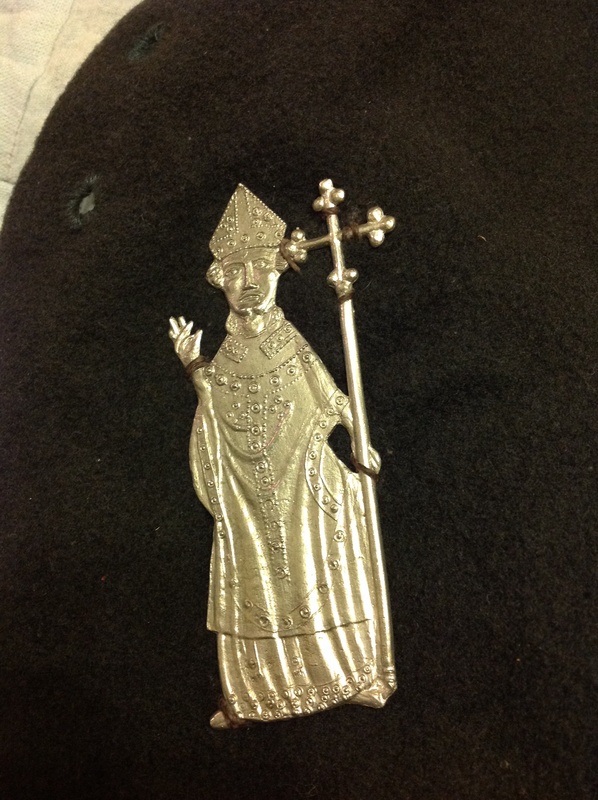 In this activity, a selection of some of the finest Thomas Becket pilgrim badges have been sewn on to various items of medieval clothing (as they would have been), such as hats and doublets. They include badges representing his murder or a badge of the murder weapon that killed him. Information on each badge describing what it represents is sewn on to the clothing. The children are invited to try on the clothing, study the badges and their descriptions. They are then asked to design their own Thomas Becket badge/s based on the badges they have seen and their own knowledge of the Becket story. Information sheets about Becket can be provided for those that have not studied Becket yet. This activity is designed to take 30 to 45 minutes. We are currently investigating the possibility/cost of having the best badge designed by one of the students made into a real pewter badge for the student to keep. We will post back here with any news. Alternatively a small prize could be awarded of a replica medieval coin or pewter badge perhaps.